Blue Ridge Electric Membership Corporation is warning the public about telephone scams targeting members. These scams occur year round but several reports from members have been received recently, including business accounts. Typically the caller demands immediate payment over the telephone and threatens to disconnect their electricity if the member doesn’t comply. Sometimes the caller suggesting purchasing a prepaid, reloadable debit card. 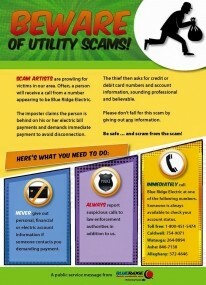 If someone calls asking for immediate payment on your electric bill, don't give out your personal information! This includes your Blue Ridge Electric account number, your banking information, social security number or any other personal information. or toll-free: 800-451-5474. We’re available 24/7. You can also set up secure, 24/7 access to your Blue Ridge Electric account at www.BlueRidgeEMC.com. Always report fraudulent calls to your local law enforcement authority as well as to Blue Ridge Electric. Blue Ridge Electric serves some 74,000 members in Caldwell, Watauga, Ashe, Alleghany, Avery, Alexander and Wilkes counties. For more information, visit www.BlueRidgeEMC.com or call a local Blue Ridge Electric office.